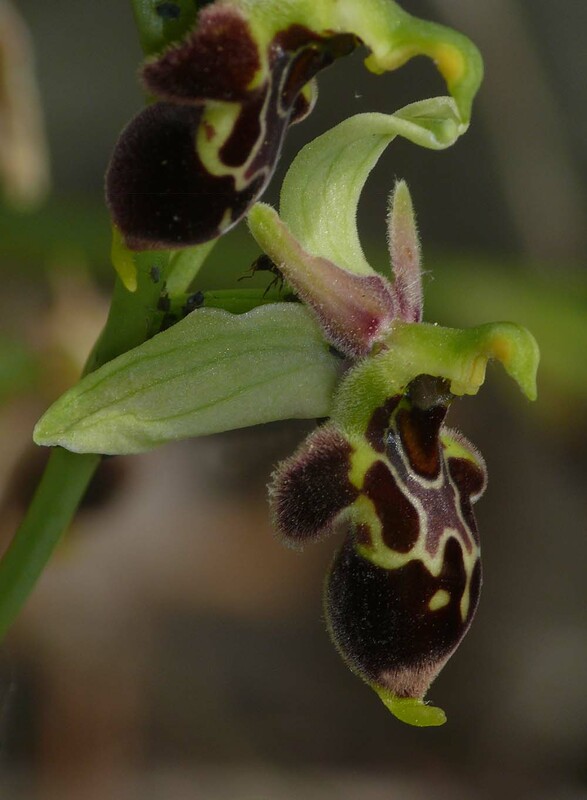 O. oestrifera ssp montis-gargani has been recognized from the Gargano peninsula for many years but until recently was known by several different names including O. cornuta and O. rhodostephane. The latter identity was thought to be part of a disjunct colony west of its normal and restricted Dalmation range across the Adriatic. This theory never fitted comfortably with many authorities and for several reasons, not least the larger proportions of the lateral lobes and the colouration of the sepals. In O. rhodostephane, sepal colour is predominently pink (and often vividly so) whereas with O. oestrifera subsp montis-gargani, white or very pale pink is the norm. 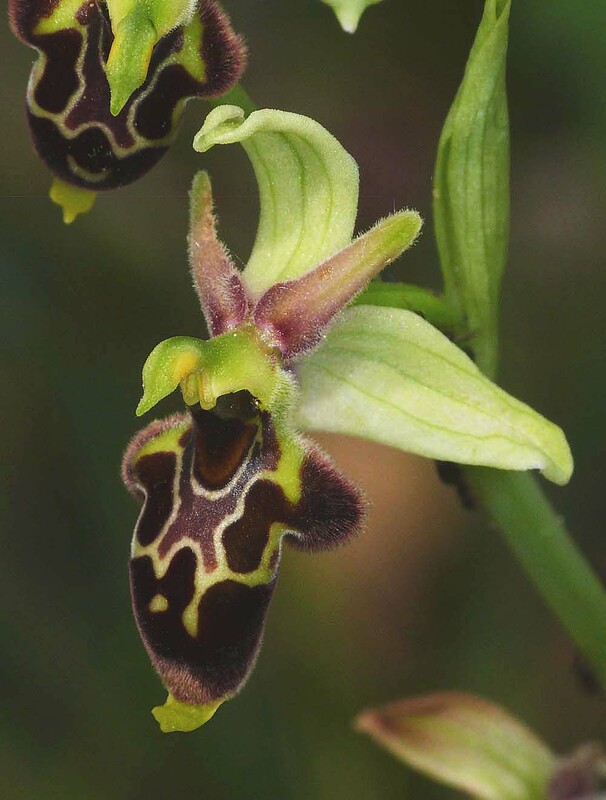 These uncertainties were eventually resolved in 2010 by a group of Dutch botanists headed by Van de Vijver and Van Looken who collected and formally described the orchid under the name of O. oestrifera ssp montis-gargani. Its distribution is not known with certainty but it has several stations within the Gargano peninsula and may well have a wider range on the south east coast of Italy. It is not however a common species and its presence is extremely localised. 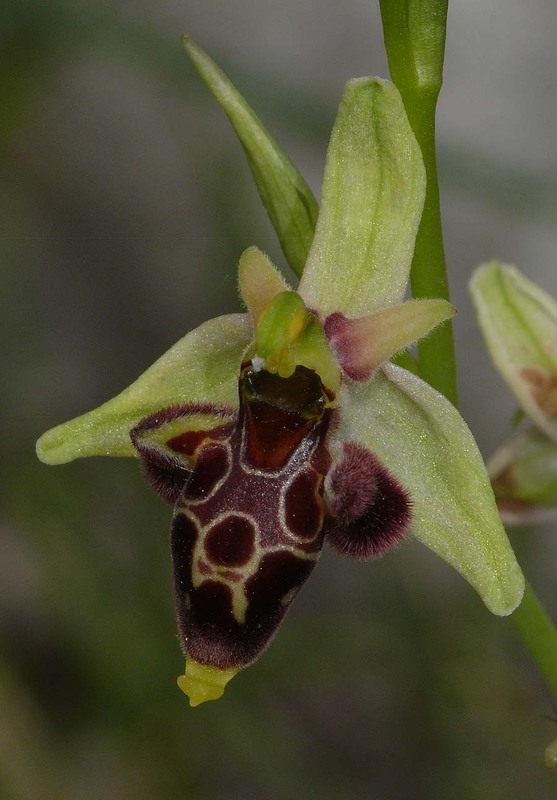 By definition therefore, hybrids are not common and crosses with a similarly uncommon species of Ophrys such as O. archipelagi are extremely rare. Despite the fact that both species are known to prefer a degree of shade, the plants depicted here come from a single small colony growing on open limestone pavement at a relatively high altitude near Monte Sacro. All the photographs are from Gargano and date from the 15th of May.